If you are a camper, truck refrigerators are a great accessory. In case you are tired of buying ice for your coolers while on the go or having to deal with the melted ice at the bottom of the cooler, then consider buying the best truck refrigerator that your money could buy. There are a number of options and thus, ensure that you get the perfect one for your truck. Look for one which can operate on various AC so that apart from running on your truck’s 12V, you will be able to plug it in even when you are at home and make it cold before you move it into the truck. 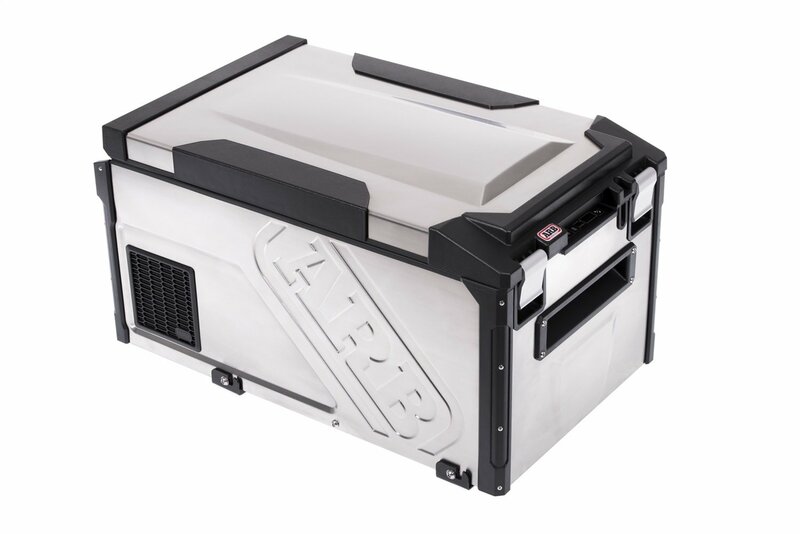 It is a rugged, weatherproof refrigerator for the truck which might be good for off-roading, camping, or any other outdoor adventure that you might be planning to go to. If you plan to take drinks and food with you and you need them to remain cool, this compressor-based refrigerator freezer might just do the work for you. I have it in my truck and I like the way it handles my drinks and food whenever am on transit or going out with the family for a picnic. 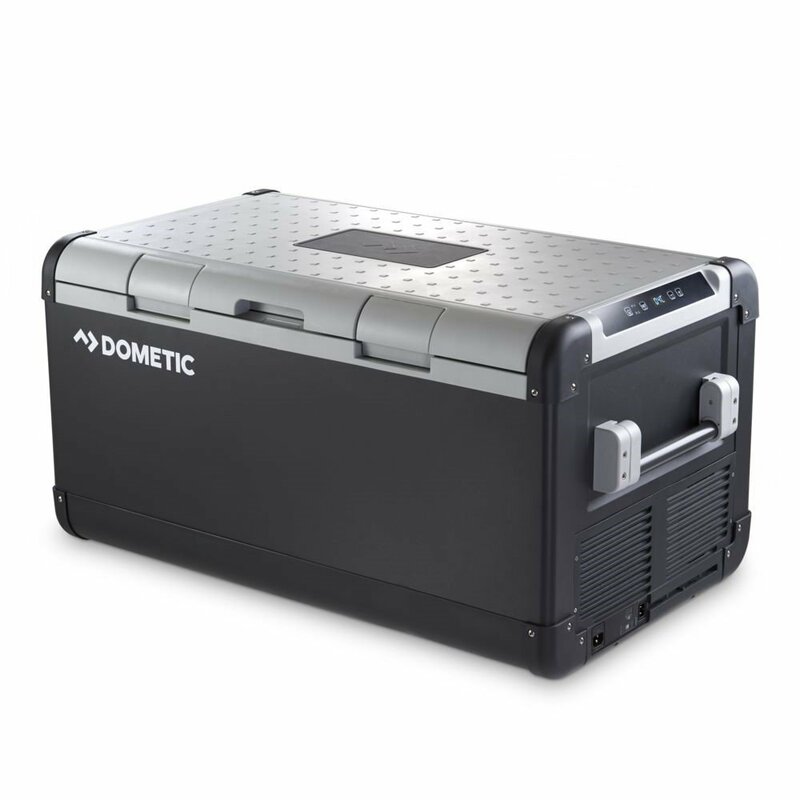 It has a zero degree freezer capability, with plenty of space and can accept the 12VDC power and thus, you will be able to keep all the food you want to take with you. Its body is made of stainless steel, latches that are anodized aluminum, control panels that are waterproof, and an integrated locking system that is electronic. For an awesome day at the beach, you will be able to fit 12oz cans. Its capacity is 60L. It is a truck refrigerator that has a lid that is assisted by an infinite position gas spring, making it be very unique. Its hinges are made of stainless steel which is heavy duty and thus, even when you are off-roading, there is no worry that the refrigerator will come out of position. The control panels are weather protected, and it has a backlit LED display with a dimming function meaning, even when it is dark, you will be able to access your drinks and food without much strain. When you remove it from the truck, it has an easy carry handle design which will enable you to easily carry it to the campsite or into the house. Its basket is a cabinet type which is reversible and it has a divider so that you can separate and arrange your food accordingly. With the built-in 3 stage battery protection and the drain plug, you rest assured that your battery won’t go flat on you even if the refrigerator is left on throughout. 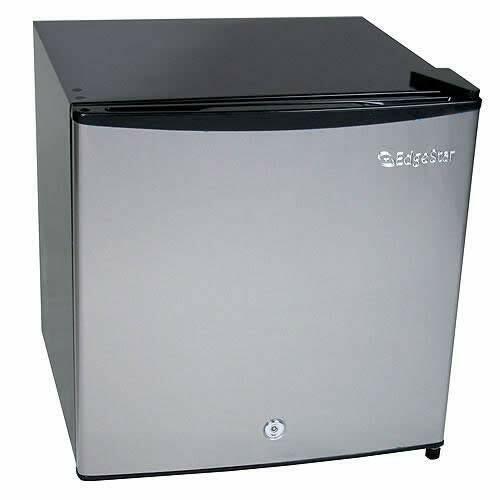 It is a compressor fridge and freezer which can hold up to 95L which includes 40 liters of the freezer. It has a dual zone, dual lid, and dual temperature control. It has two compartments with each compartment being able to operate independently in any combination as a freezer or fridge and with a capability of achieving -18 degrees Celsius at the same time in an ambient temperature of up to 32 degrees Celsius. When you buy it, it comes with an application which will enable you to control the compartment temperatures from your tablet or smartphone. Even in extreme outside temperatures which are extreme, the technology of the energy compressor will allow you to get fast and efficient freezing and cooling with this particular refrigerator. The design is robust and with rugged features which are made to ensure that the refrigerator is able to endure environments which are extreme. You will be able to set the temperatures between 10 and 18 degrees Celsius when in normal use, with the ability to run at -22 degrees Celsius up to 50 degrees Celsius when below ambient temperature. It is spacious and can accommodate 133 cans. It comes with a polypropylene lid which is completely reversible and detachable for functional use. Getting it will ensure that the two compartments will be able to work separately and you can be able to monitor their temperatures separately. For increased energy efficiency, it has two separate reversible lids which are 22mm wide with pocket gaskets that are multi-air. Whatever the light condition, its ergonomic control panel consists of dual blue LED display and this will make you have clarity as you get something from your refrigerator. For mobile and tablets charging, there is an external USB outlet for added benefit when you are at the campsite and thus, your phone will not go off. It has 3 stage battery protection to ensure that your battery doesn’t drain and also, you have an alternative of using solar. It is a standard unit which might be the right one for your truck at a lower price than many other fridges. If you cannot afford an ARB, then this might just be fine. Though you are going to save money with it, you will have to sacrifice when it comes to supporting and reliability. It is a refrigerator which comes with a two-year limited warranty and at times, it might be hard to get parts and servicing when you are away from home. I would wish to alert you that, as much as you are going to save on cash, this fridge is not a true AC/DC fridge as you will require an aftermarket converter to enable you to plug the refrigerator into a standard 110V AC outlet on the wall. The average power consumption of this particular refrigerator is 50W with its average power draw likely lower. It is priced in the budget range and thus, you are likely going to save some money when you purchase it. Features on this fridge include low voltage cutoff, digital controls, interior lights, and drain plug. It doesn’t have accessories such as insulated covers and slides, but that should not prevent you from purchasing it if that is your choice. Due to the fact that they don’t come with a wall adaptor, you will need to separately purchase an add on the AC converter for you to be able to plug it into the normal three-pronged outlet. It is a model which can be either all freezer or all fridge. It has a cabinet that is black, euro style, modern looking, stainless steel door that is stain resistant, and a full range of manual thermostatic control. If you pick this as your model of choice, it is important to know that, it becomes a true 0 degrees F freezer which is a rare occurrence for models in this particular category. It is a model which has the most flexibility when it comes to its placement due to its compact size which makes it a great option for placing and storing the refrigerator in small areas in the truck, kitchen, office or at the campsite. It can also be a great dorm refrigerator. I found it to be a good option to make it to the top best truck refrigerators due to a variety of reasons one being that it has an energy saving manual defrost and thus, you will save when it comes to power consumption. It will also save you space since it is a flush back design with recessed handles. It comes with a built-in security lock with two keys and thus, you will be able to keep your food and drinks safe. There is quick flexibility in placement due to the quick change reversible door of this particular fridge. To crown it all, the manufacturer gives it a one year warranty to make you stay easy in case of replacement of mechanical problems along the way with 90 days labor. If you are looking for compressor 12V refrigerator for your truck, this might be an option. It can be able to deep freeze your food. For the size of the unit and the value which it offers, it is a refrigerator which is affordable. You will be able to fit up to 25 cans, in liters, 20 L which will be enough if you are a couple of people going out for a weekend to camp. It is a straightforward and simple design that made me like it a lot. The only precaution I will let you on is that, you ensure that you carry it carefully and also when you are putting it down, handle it with care as it doesn’t seem to be too thick. It can operate in both Eco and Max mode but I like the Eco mode as it saves a lot of power. But you should remember that it only works well when the truck is running and it is plugged in the cigarette lighter or if stationary, it must be plugged into a wall outlet. But if you will be using your battery to charge it, then it might bring problems. This refrigerator has a battery protection mode which seems not to work to my satisfaction. When it is in its highest battery protection, it will only turn off when the battery reaches 11 volts, which can be equated to draining power from the battery. If you will be using your truck battery to run it overnight, you might find that in the morning, you have a flat battery. When it is on its lowest setting, the battery protection drains the battery further to 9.5V, a scenario which is likely to damage your battery completely. If you want your food to remain cold for the next 24 hours while you are out camping, then it will be best to spend your money purchasing a refrigerator you are sure is going to work in your truck. The main advantage of the Smad 12V is its efficiency. They consume about 10amp per hour on a 12V system in your truck. This means that, if your battery is a standard deep cycle, then it can run this particular refrigerator for at least 5 days. If your truck or RV has a solar system, then you can keep this unit running indefinitely. It uses a specific compressor which is designed from the ground up to be run on 12VDC electricity. Though they might not be cheap in price, when you want your food to remain cold for a longer time, then it might be the best option. It is a low turnover compressor meaning, it doesn’t require any high current in order to start and its total current draw per hour is about 0.87amps. Due to the fact that, you can run it for 5 days on a single deep cycle battery without the need to charge it, then it means that, if you want it to last for a longer time, you will have to use a 50W solar panel or just drive the truck for 10 minutes and that will be enough to run the refrigerator for an entire day. In terms of functionality, this unit might just be the ideal solution. The only issue I found with it is its high price. It is not easily available with those vendors selling it doing that at a very high price. You can get yours on Amazon as they have a lot in store with at times putting them on sale and thus, if you catch it at that particular time, then it will be a bit affordable. Although it is expensive, you are getting value for money. Its efficient seems to be on top of many other refrigerators for trucks in the market. If you are planning to go out camping on your truck, then there is a need for you to get a great refrigerator to keep your drinks and food cool. This particular unit will be a great companion on any recreational event which you are planning to undertake with family and friends. What makes this particular refrigerator awesome is its ability to run perfectly well on your truck battery, withstand bumps and scrapes as you go off-roading. Your food and drinks will enjoy this great cooling system. It will hold your food supply for the weekend as it carries enough food for a couple of people. You have the option of setting your desired temperature ranges between 4 degrees Fahrenheit to 68 degrees Fahrenheit with both options of Eco and Max for fast cooling and energy saving respectively. It is capable of working on 110V, 12/24VDC power source making it easy for you to move it from the house to the truck. The original package comes with an AC and DC power cord. When you change the power source, there is no need for you to reset the temperature due to its memory function. It has intelligent power protection whereby, you have the option of choosing high, mid or low depending on your circumstances with the control programs monitoring the battery so that it doesn’t drain to flat. When the input voltage is lower than what you have set, the compressor will automatically shut to avoid the car battery from running down. With its energy saving design, you are assured that the refrigerator is not going to consume a lot of energy immediately it reaches the temperature settings. At that particular setting, your food and drinks will be kept frozen by the insulation for at least 10 hours even after having disconnected the unit from the main power source. This makes it be a great option especially if you are going to camp in the interior where the power source is a problem. You will be able to clean the interior of this fridge easily using detergent and clean water due to the drain plug which is placed at its bottom. This is a great option for picnics, camping and you will enjoy your time with family and friends. I bought it for my Daddy during fathers day and he loves it a great deal. Know if you need a lot of room or you just enough where you can keep your drinks and food while on the move. Know which temperatures you will be operating in; are you going to be mostly in moderate to cold climates or they will be hot? Know if you will only be using the 12V DC power of your truck or you also have readily available 120V power. If you are a short haul, then it means that yo don’t have sleepers meaning, you will have limited space. When it comes to storage of food, you will not be able to store your food for quite a long time since the time spend on the road is short and thus, you will have an option of stopping and refilling your refrigerator. So if you are a short haul, you will require a small refrigerator just designed for snacks and beverages. 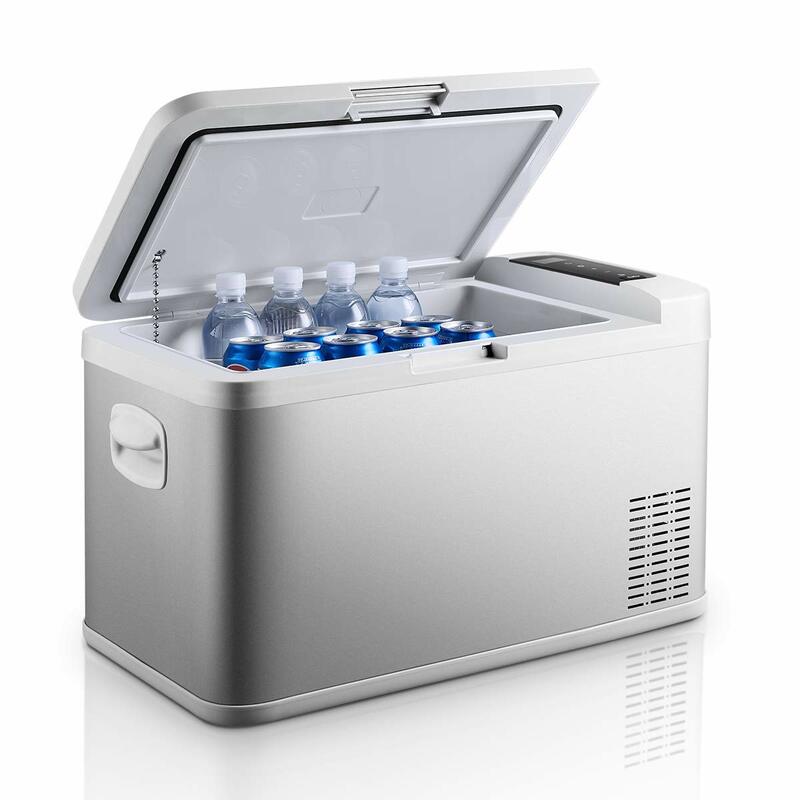 Instead of a refrigerator, you can decide to go for an ice cooler or an electric cooler. As a long haul, you will have sleepers of sorts and also, you will have more room where you can store a refrigerator on your truck. Due to less stoppage along the way, you will require to store more food and drinks for a longer time. 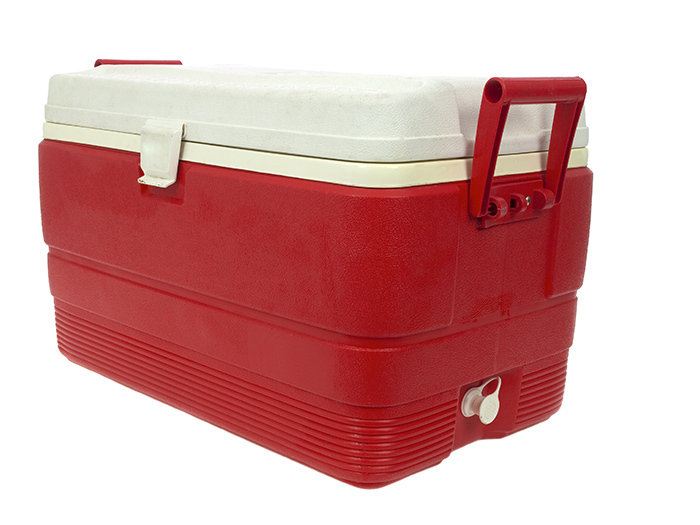 This means that, an ice cooler might not work for you as a long haul trucker. For trucks, you will have an option of two refrigerators to choose from; true compressor based refrigerators and thermoelectric coolers. If you decide to buy a compressor based refrigerator, it works like the one at home in your kitchen. If your choice is a thermoelectric cooler, then you need to understand that, in order for them to perform, they rely on the ambient temperature. In normal circumstances, they are rated to be able to cool down to 40 degrees Farenheit below the ambient temperature. What this implies is that, if you are always in temperatures, which are cooler, it might be easier for it to reach the right temperature to cool your drinks and to be able to ensure that your food is preserved. 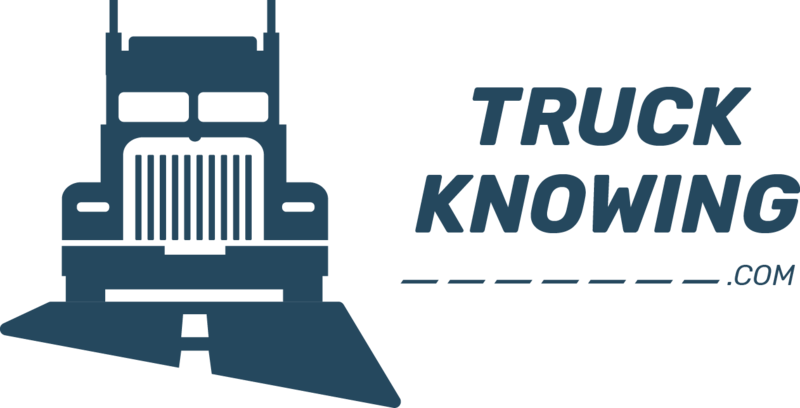 When it comes to hot temperatures, then it will be tough for you to regulate its temperatures in the truck with the cooler struggling to get to the temperature of about 45 or 50 degrees Farenheit. Depending on the type of food you are carrying, it might be difficult to keep it cool enough or even to preserve it. Chest Refrigerators: The advantage of chest refrigerators is that, when you open, there is less loss of temperature from the refrigerator as the cold air is able to stay inside. Chest refrigerators have their own disadvantages which include that, you will have to get the food stuck in a horizontal layer and in order to get the food at the bottom, you will have to remove all the food at the top to get to the bottom. Most chest refrigerators tend to be designed to be easily portable with features that make them to be easier to carry around. This portability of the chest refrigerators will be able to give you a lot of flexibility to use them in different vehicles like when you want to use your personal car instead of the truck and when you are way camping or in a sporting event. 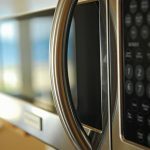 Upright Refrigerators: When you open an upright refrigerator, it lets cold air out and allows hot air to come in and it is going to take the refrigerator several minutes before the temperature inside is restored back to normal. It also allows you to stack food vertically and thus, you will able to get the food that you need with a little effort. The downside of this type of refrigerators is that, they are not designed to be portable and thus, if that is what you choose, you will need to plan to leave them at a stationary place for most of the time. When you think about a truck refrigerator, in most instances, you might be referring to one without a freezer. It is possible to get freezers as stand alone or combined in the refrigerator that you are purchasing. While doing your shopping, you will come across models which are able to turn an entire refrigerator unit into a freezer or a fridge and thus, you will have to choose which one is best for you depending on your specific needs. In case you are on a budget and you tend to like the standard compact refrigerator, then you will either have to purchase an inverter or ensure that your truck has an AC port. When you have an inverter, it will be able to convert DC power into AC power. Before you purchase an AC fridge, you will need to check out its power requirements to ensure that, you are getting the right inverter size for it. 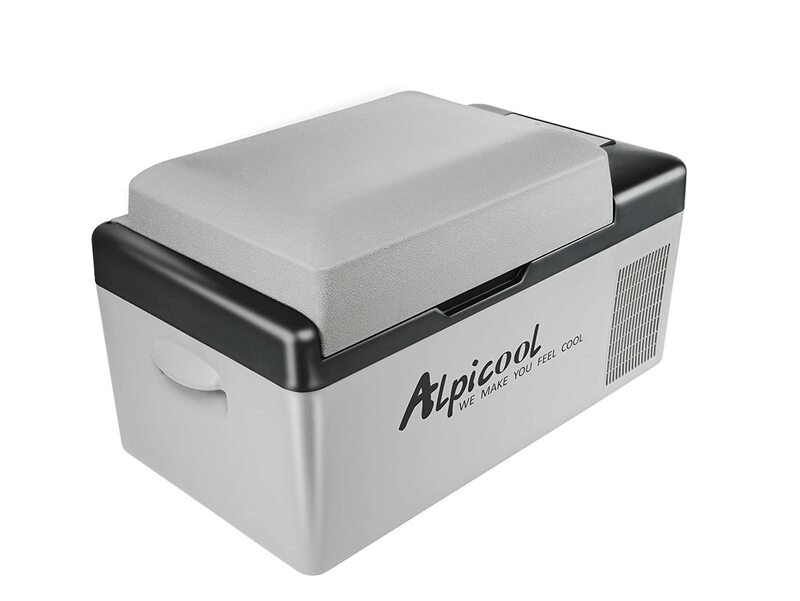 A cost term immediate solution for you might be a quality ice chest which should be a must have in your refrigerator. Although in the long run it might turn out to be expensive due to the need of always having to buy ice, but on a budget, that might be the best thing to do. Compact refrigerators are good options, but they can also have their own disadvantages. It might be hard to place them on the truck due to their boxy style. You will need to use an inverter since they utilize AC power. If you open them most of the time, then it becomes hard for them to keep cold because whenever the door is open, cold air leaves the refrigerator and hot air enters. Due to their upright configuration, you will have to ensure that you swing the door and although their might be room to keep the fridge, you might lack room to open the door. It is easy for drinks and food to fall out of them whenever you open the door due to the fact that, when the truck is moving, there is shifting that happens inside the refrigerator. And since these compact refrigerators are not designed to be portable and at the same time, cannot endure shock and vibration of rough road riding, it might not be the refrigerator to purchase. In most instances, a compact refrigerator is not a recommendation for a truck. They can be cheaper than the compact refrigerators and their design is in such a way that, they are portable. They are capable of cooling down up to 40 degrees Fahrenheit below their ambient temperature and this means that, they might not be the best to use in temperatures which are hot. Generally, they don’t seem to cool very well. On the positive, the thermoelectric refrigerators can be used to warm drinks and food. They come in mountable and portable models and if you consider them for your truck, they you should be ready to use some good money as they are very expensive. They are compressor based and thus, they will be able to keep your food and drinks cold just the way your home refrigerator. If the portable model is your choice, then you will be able to remove them from your truck to use them in your personal car, at sporting events, at campsite, in your home or any other outside adventures. You will also use either AC or DC power and this indeed, adds to their flexibility. Mountable models are normally upright and tend to work like the compact refrigerators. Their advantage is that, the shock and vibration will be able to be taken away, something which is associated with moving vehicles like trucks and RVs. When you get a truck refrigerator that meets your needs, especially when you are out camping, it will give you the ultimate freedom to keep your food cold just the way you do it at home. If you want a freezer, you can set the temperature to go below freezing and thus, you will turn the whole unit into a freezer. If you want it to become a fridge, you can set the temperature to a level where it becomes a fridge. There are models which allow you to use a single compartment as a fridge as well as a freezer while others have separate compartments for a fridge and a freezer; choose what best works for you. 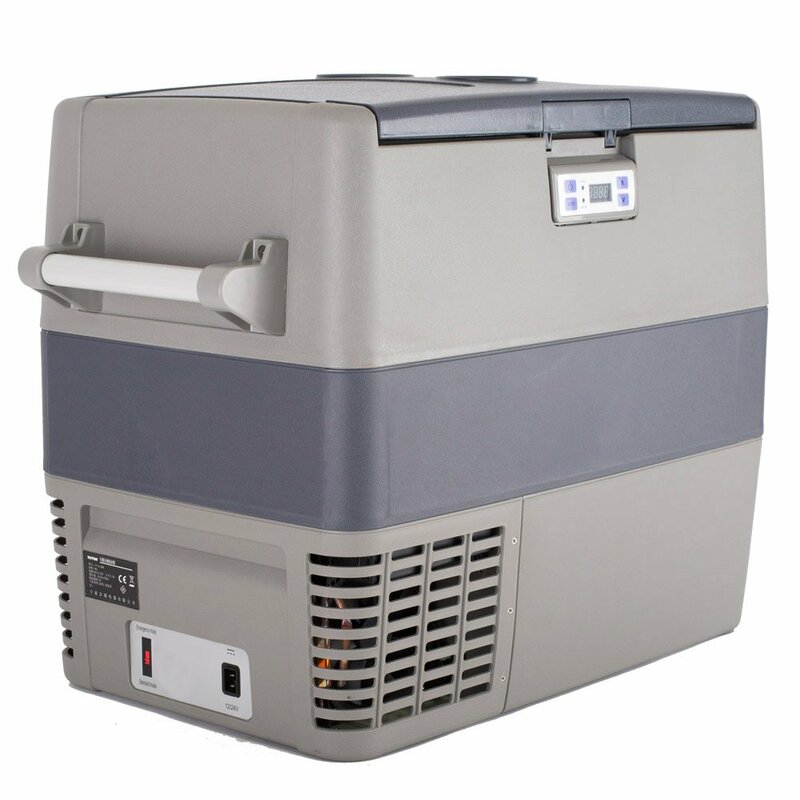 The ARB 10810602 Portable Freezer/Fridge Weatherproof is my best pick due to the main features loaded in it. The body is strong, made from stainless steel, the moldings are ASA plastic, latches are made from aluminum, and the hinges are made from cast stainless steel. All these make it be the best for the outdoor, off-roading escapades on your truck.